Game Seven’s majesty wouldn’t have happened, however, without So Taguchi’s heroics six days earlier in Game Two at Shea Stadium. After winning Game One, the Mets took a 3-0 first inning lead thanks to a rough night from Chris Carpenter — he gave up five earned runs and walked four in five innings pitched. The Mets led 6-4 in the seventh inning and David Eckstein and Chris Duncan quickly grounded out and flied out to start the inning. That Guy Who Used to Play First Base then singled and Jim Edmonds walked, bringing up Scott Spiezio and his little red facial hair thing — starting at third base for the game instead of Scott Rolen. The Speez launched it very deep to right, off the top of the wall, and ended up at third with a game-tying triple. And you can watch So’s magic moment, and then the rest of the ninth inning as well — That Guy and Spiezio both doubled, Juan Encarnacion singled and the Cards scored two more runs in the top; Tyler Johnson (remember him?) and Wainwright retire the Mets 1-2-3 to close it out as the Cards tie the series 1-1. 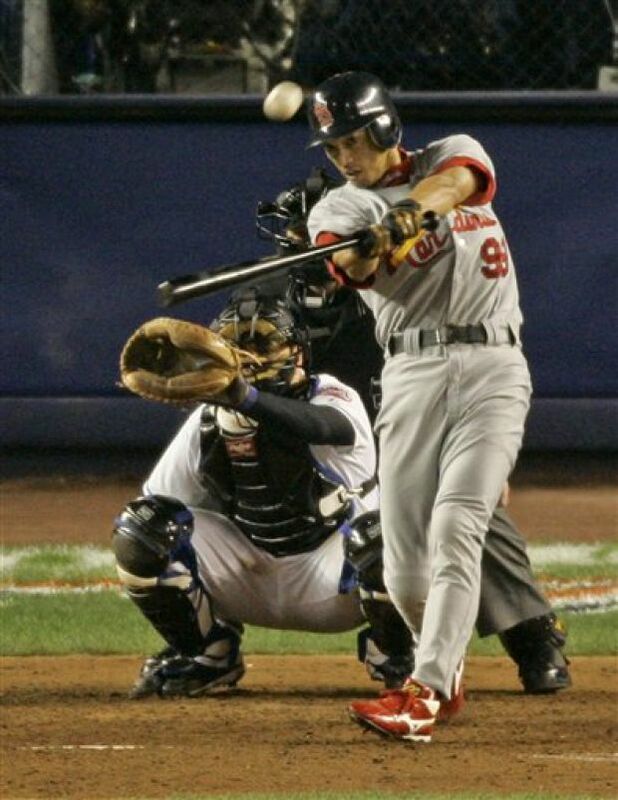 This entry was posted in General Cardinals and tagged 2006 NLCS, Adam Wainwright, Billy Wagner, Jim Edmonds, New York Mets, Scott Spiezio, So Taguchi, St. Louis Cardinals, That Guy Who Used to Play First Base, Throwback Thursday, Tyler Johnson by Christine Coleman. Bookmark the permalink.